Have you ever dreamed of breaking out of your daily routine? What about buying a one-way ticket to Europe with only a backpack and bike by your side? That’s what Beth Puliti did. The former nine-to-fiver turned freelance writer set off this summer to explore Eastern Europe all from the saddle of her bike. Love to travel? Try the 2015 Grand Prix. Your grand adventure awaits. How did you begin riding bikes? Fresh off of training wheels, one of my very first memories is being told by my dad not to ride through a puddle—then getting hollered at for doing just that. (Hmm, the start of my love for riding off the beaten path perhaps?) Early on he’d also take a handful of kids and me biking on “real” roads outside of our neighborhood. 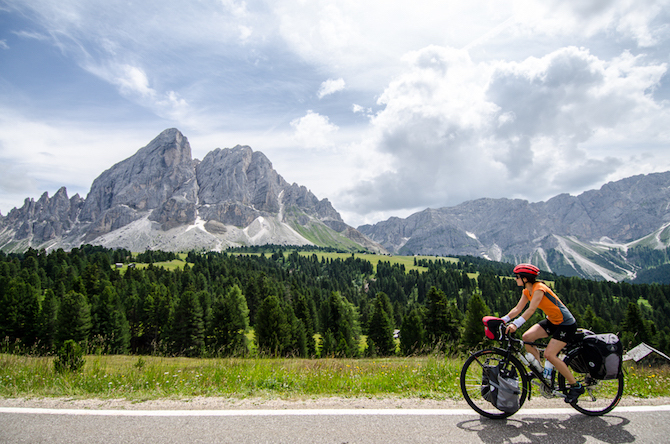 The miles were short, but the rides were long—we’d stop for water breaks, stop for helmet adjustments and occasionally stop to let wooly worms safely cross the street. How has the Raleigh Sojourn been? My Sojourn has been through every bump in the road in 4,000 kilometers, every headwind in three months, every peak and valley in 12 countries—and it’s proven delightfully reliable. Other than the occasional brake pad adjustment to accommodate the extra weight I’m carrying, the Sojourn requires little maintenance. I’ve even managed to get just one flat tire. Oh, and the worn-in Brooks saddle is a dream—I rode into Istanbul today sans bike kit and have no regrets! Tell us about your trip. Where have you been and where are you going? My husband and I began pedaling our bikes on July 14th in Munich, Germany. Since then, we’ve made our way through Austria, Italy, Croatia, Montenegro, Albania, Kosovo, Macedonia, Greece and are currently in Turkey, where it’s hard to make any progress if we accept every invitation to drink tea with local villagers. Our route is continuously changing, as many variables come into play both abroad and at home. We’re unsure what shape it will take after this, but Southeast Asia sure sounds wonderful. Why did you decide to go on this journey? Over the past 10 years, I had finished my education (and still have nightmares about it), landed a nine-to-five, bought a house and got married. All that was missing from my very own American Dream was a white picket fence and 2.5 kids. I was supposed to find comfort in the normalcy of it all, but instead I found it all rather predictable. I had open-heart surgery last fall to prevent early heart failure and suddenly predictable wasn’t enough. I needed to put the life back into my newly extended one. And what better way to shake things up and gain some perspective about this world we live in than exploring it on two wheels? What's your biggest accomplishment so far? Without a doubt, getting out the door. There are so many reasons to stay home. So many things holding us back from doing what we really want to do. Though it was far from fun while in the throes of packing away every possession, showing our home, selling our car, cancelling our bills, and so on, it was a huge achievement that allowed us the freedom to leave home and actually live out our dream without looking back. What's the coolest thing you've seen on your Raleigh while traveling? Other people doing the same thing. 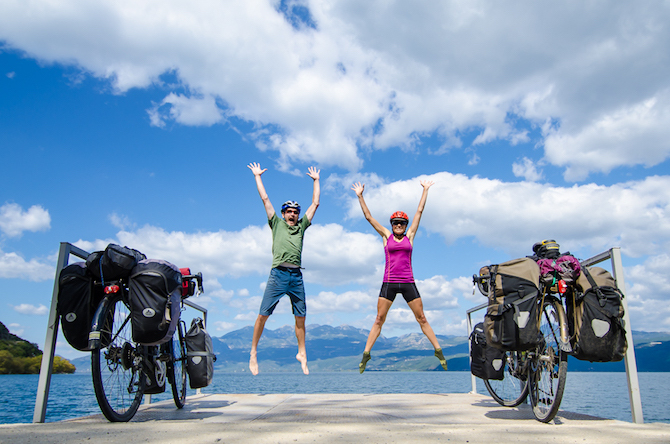 We’ve met a group of American college students outside of Venice, two Polish tourers outside of Rome, an Australian couple touring on a tandem in Montenegro, two ladies from the UK in Macedonia, two German guys in Croatia…the list goes on. People from around the world are traveling the same way we are, and when we bump into them on the road and share stories—and sometimes a room over a gas station—it’s the coolest bond ever. 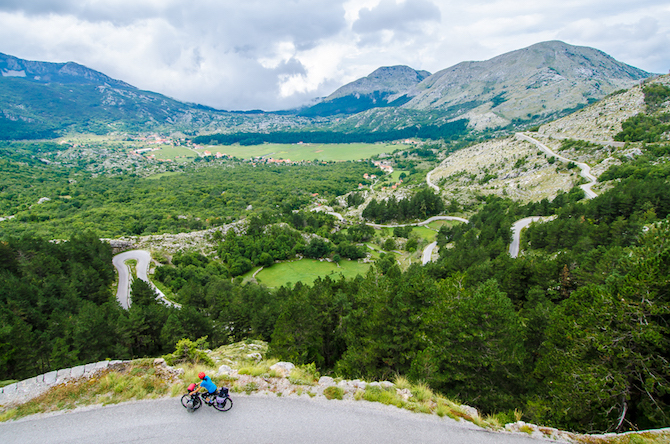 What do you like most about riding your bike? I’m an over-thinker. When I’m riding, I’m forced to get out of my head and focus on the road or trail in front of me. It’s very mind-cleansing for me, and probably the closest I get to actual meditation. Any tips for other people looking to take a big bike trip (whether it's dropping everything for a few months, or taking a week or two to get away)? Life is full of unexpected challenges. There will always be less than ideal circumstances holding you back. Don’t wait. For more of Beth's adventures, visit her blog HERE.